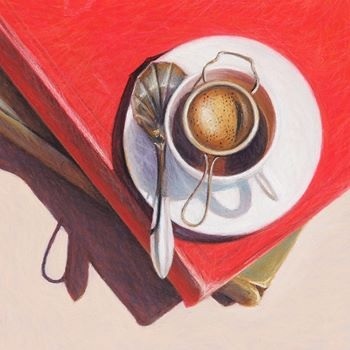 Kylie Sirett's beautiful framed pastel, Tea Readings, was generously donated by the artist for raffle at the 2018 Warranwood Art Show. Winning ticket was drawn and announced on Sunday 29 April 2018 at Warranwood Art Show, won by art show visitor, Lyn McGoldrick. Warranwood Art Show thanks Kylie Sirett for her generous donation of artwork for raffle. Proceeds from the Warranwood Art Show go to the School Communication Association of 'the Melbourne Rudolf Steiner School' towards new equipment, upgrades and improvements.